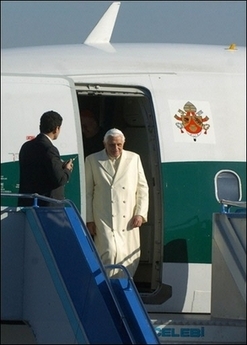 Pope Benedict XVI has arrived in Turkey! Pray for him as thousands of people are protesting his visit. A book has even been published on how to assassinate him! So, please pray for him - his safety and the success of his papal visit. For the schedule of his visit and links to the events with photos and descriptions, please click here. My prayers are for the safety of our Holy Father and the success of his mission to build bridges of faith.